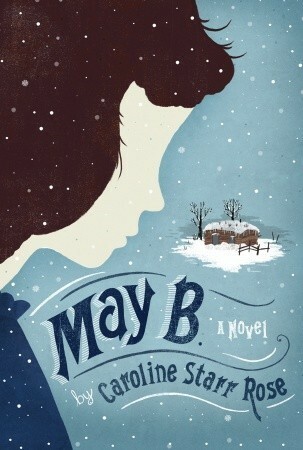 May B. by Caroline Starr Rose. Schwartz & Wade Books, 2012 (currently available). Face Value: This is a fantastic cover. In fact, this is a book I wanted to read because I saw the cover and picked it up in the bookstore. I can’t stop looking at it. Here we have a cover that looks both totally historical – no misconception that we aren’t on the prairie, but also totally hip. The silhouette, the falling snow, the homestead in the background. Plus, the use of illustration and silhouette, as opposed to photographs, let’s May’s face be visible, without projecting an overly specific visual of her to the reader. Does it Break the Slate? YES. Mavis Elizabeth Betterly, or May B. is determined to survive and she uses her intelligence, resources, and resolve to survive a prairie winter alone. But even outside of her fight to survive, May B. is a Slatebreaker. Here we have a young woman who can identify what she wants in life and takes steps to get there. Reading is challenging for her, due to her learning disability, but she doesn’t give up. She sees possibilities for herself outside of the confines of her situation, both literally, trapped in alone in the sod house, or on a larger scale, as a young woman facing a future on the homestead. Who would we give it to? The audience for this book is pretty easy. Any self-respecting Little House fan will be swept up in the details of May’s life on the homestead and on the edge of her seat as the snow starts to accumulate. But for those who express interest in prairie life but can’t quite get into Laura Ingalls Wilder’s description-heavy prose, the crisp simplicity of May’s poems will make for a quick and easy read. Review: May B. (short for Mavis Elizabeth Betterly) is sent away from her family’s homestead to help out a neighbor and his new wife 15 miles away. Seems like nothing to us, but 15 miles is world away in the endless Kansas prairie. Promised that her stay will be “just till Christmas,” May is still furious at being sent away, When she gets there she finds a stoic farmer and his miserable new wife. Alternately demanding and indifferent, the Oblingers don’t make May’s time away from her family any easier. Then May finds herself alone. At first she rejoices in the freedom, but she quickly realizes that with winter coming and no one aware of her solitude, she has to figure out how to survive. Caroline Starr Rose uses elegant verse to capture both May’s internal monologue and the sparse, desolate nature of the landscape. ‘You’ll bring in some extra money,’ Ma says. one less child to clothe. Now I can do what I want. Even in her terror, May recognizes the rarity of her solitude, and what it means to be responsible only for herself for the first time. And ultimately when it comes time to survive, May absolutely has it in her. She finds food, she protects herself. She survives alone for months, with nothing but herself. She gets herself through the winter and she gets herself home. And ultimately it’s her journey that makes her realize how much she is – and will continue to be – capable of. This entry was posted in Middle Grade, Reviews and tagged Historical Fiction, Homesteads, Learning Disabilities, Poetry, Prairie, Survival. Bookmark the permalink. Quick question: when you put books in the “middle grade” category, how are you defining that category? middle school (grades 6-8?) Just wondering…. For me its more fluid than that, and dependent on the reader – a middle grade book is appropriate for somewhere in the range of 3rd through 6th grade (though certainly there are readers on the outside of both of those spectrums who will find appealing books) and young adult is targeted for high schoolers. What’s tricky about that, obviously, is that it leaves out 7th and 8th grade readers. And that’s where I feel like it comes back to being reader specific. There are some 7th and 8th graders ready to jump into YA wholeheartedly, some that are still reading middle grade novels. And some books in the world of middle grade that can easily target up, others that don’t. That’s obviously much more about content than it is about difficulty level. It’s interesting – one of the libraries I go to has a separate “middle school” section, where they put a mix of middle grade and YA titles. It’s always interesting to me what I find there, compared to my other main library where there’s a definite children’s versus YA split, and anything for someone out of elementary school is clearly in the YA section. Exactly, it is all tricky–and I asked in part b/c sometimes I can’t quite tell from the “who would we give it to” section how to evaluate the age/maturity judgements you’re trying to convey (although that’s a small critique in the vast amount of admiration and fondness I have for all the reviews here, I hasten to add). My daughter is in 3rd grade now, and she’s a very fluent reader in some ways, but she has very limited tolerance for books that are scary, and she’s a literal enough reader that she struggles, at the moment, with characters that are duplicitous (she accepts everything at face value and doesn’t see the deceit and thus gets lost in the plot). So choosing books is tricky–right now we’re reading a lot of Eleanor Estes, which is wonderful: plots involving interesting characters without a lot of scary drama. But finding books for younger-yet-advanced readers is not always easy, as sometimes the plots of the more advanced books aren’t quite right for the younger readers, no matter how fluent. Which is all a long way around of saying thanks for the clarification!